As a woman who cares about skin quality and anti-ageing, I am constantly on the lookout for something which will make all the difference. However, as a doctor by profession with a naturally scientific mind, I find myself questioning ingredients, and more importantly proof or evidence for many of the claims made by large companies advertising glamourous facial products. The sad fact is that despite the millions of pounds of research within the skin care industry, we still lack convincing robust evidence for skin creams that truly make a long term difference. There are however, a few exceptions to this, and one such product which has been around for generations and studied widely is Retinol. Retinol is a vitamin A derivative shown in multiple large scientific studies to help a variety of skin processes. These include treatment of acne1, hyperpigmentation2, rosacea3, sun damage4 and fine lines5. Retinol works by increasing skin cell turnover, so effectively sloughing off dead old skin and helping the production of newer healthy skin. As a result, retinol can sometimes leave the skin a little red, peeling or dry, if overused. However, the scientific evidence is clear; use it properly and regularly and the effects are fantastic! I suggest to almost every lady I see in practice, young or old, that if there is just one staple to be included in a skin care regime, it should be a retinol-based product. Even someone who is low maintenance can still remember to dab some on before bedtime! 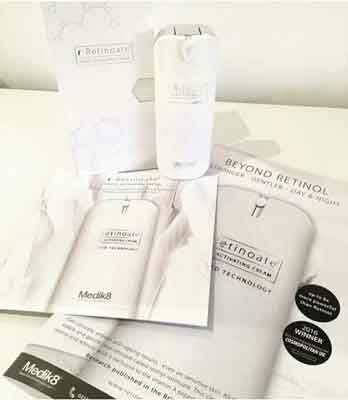 There are 2 main Retinol based creams on sale at Barstable Medical Clinic. The first is RetridermR , a light weight serum which is available in two strengths, 0.5% and 1%. Beginners to Retinol should start with the 0.5% because of the effects described earlier in the article, until their skin adjusts and begins to tolerate it. RetridermR is very affordable at £50 and lasts several months. The most superior retinol product on sale, which is new to market and recently voted Winner of 2015 Cosmopolitan “Best New Moisturiser” is Retinoate- Youth Activating Cream . The manufacturers claim this is the first retinol product which is stronger in concentration yet gentler on the skin, thus minimising potential redness or peeling. It retails at £140 and again lasts several months. The other important key message here is that most decent strength Retinol based creams are prescription only – so can only be sourced and recommended by a doctor or appropriately trained nurse. At Barstable Medical Clinic, we are medical professionals, and what is more, we have personally tried and tested these products and have no hesitation in recommending them. Herndon JH Jr, Jiang LI, Kononov T, Fox T. J Drugs Dermatol. 2016 Apr;15(4):476-82. Ertl GA1, Levine N, Kligman AM. A comparison of the efficacy of topical tretinoin and low-dose oral isotretinoin in rosacea. Arch Dermatol. 1994 Mar;130(3):319-24. Bruce S, Barkovic S. Open-Label Study Evaluating the Anti-Aging Effects of a 3-Product, 2-Step Retinol-Rejuvenation System Following 3 Months of Treatment in Subjects With Photodamage. J Drugs Dermatol. 2017 Jan 1;16(1):23-28. Kong R, Cui Y, Fisher GJ, Wang X, Chen Y, Schneider LM1, Majmudar G. A comparative study of the effects of retinol and retinoic acid on histological, molecular, and clinical properties of human skin. J Cosmet Dermatol. 2016 Mar;15(1):49-57.